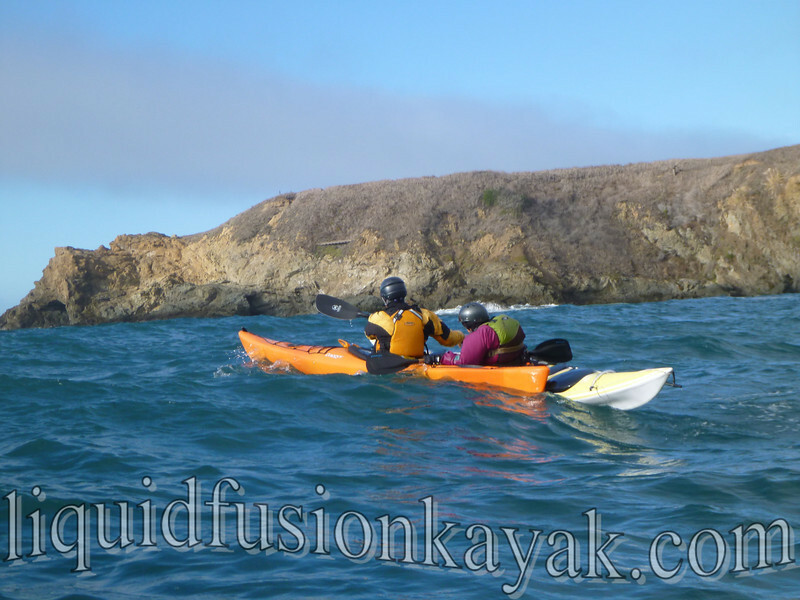 The paddling on the Mendocino Coast is world class!!! From paddling quiet protected estuaries for wildlife watching and birding to wet and wild ocean rock gardening adventures, the Mendocino Coast has something for all paddlers. The Albion area has both readily accessible. Jeff paddles through an arch in the Albion Area. Paddling the Albion River - if you are into unique paddles, this is one not to miss. Paddlers will be intrigued by the remnants of logging days and quirky Mendo style oddities as well as enjoy the wildlife of a coastal estuary. Definitely consult your tide log before paddling and be prepared for coastal breezes. The ocean waters of the Albion Area have lots in store for the coastal paddler. 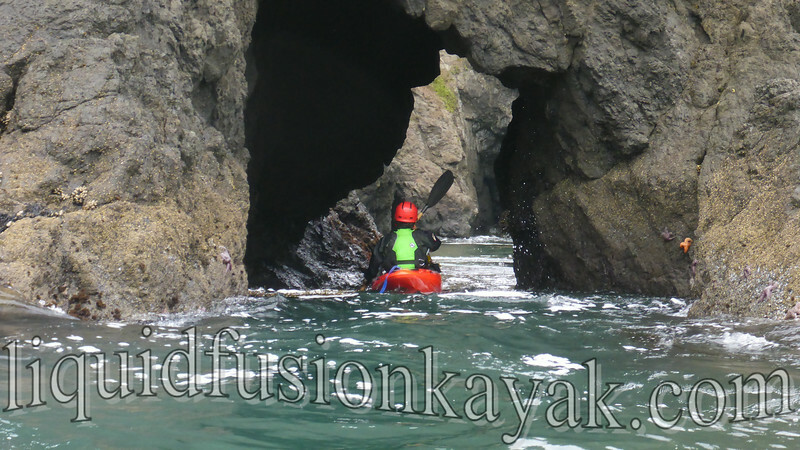 The area is strewn with sea stacks and rock gardens with a character that differs from the more popular Mendocino Coast paddling areas of Van Damme and Russian Gulch. The Albion Cove has rock garden features that range from mellow and fun to sporty depending upon the ocean conditions. On certain swells, there can be fun surf conditions. Jeff doing a little rock hopping in Albion. In some areas the rocks are mussel bound and others the rocks are padded with kelp. Please be conscientious of marine life when playing on the ocean's rocky features. Plastic kills marine life - please continue your efforts to pick up trash in our marine environment but also try not to leave plastic behind - including plastic from your boat!!! Moves that involve sliding or landing on rocks are fun and may look cool to some but often leave a trail of plastic behind. Please be mindful. Cate runs a kelp covered pour-over in Albion Bay. Ocean water temperatures in the fall are typically in the mid 50' range so appropriate thermal protection (wetsuits/drysuits) is necessary. For an idea of the water temperature and coastal conditions, check out the Point Arena Buoy Reading and NOAA's Cape Mendocino To Point Arena Marine Forecast. The nautical chart for this area is #18626. Even on a Calm Day, Albion Head can be sporty! For those interested in exploring and playing in the rock gardens, kayaking skills you should have include effectively maneuvering your kayak - forward, backward, and sideways, self and buddy rescue skills, good swimming skills. Helmets, life jackets, booties, and immersion wear with thermal protection (wetsuit/drysuit) are a must!!! Taking a rock garden class is highly recommended as there are tricks, tips, and safety skills that one does not often learn in other coastal kayaking classes. 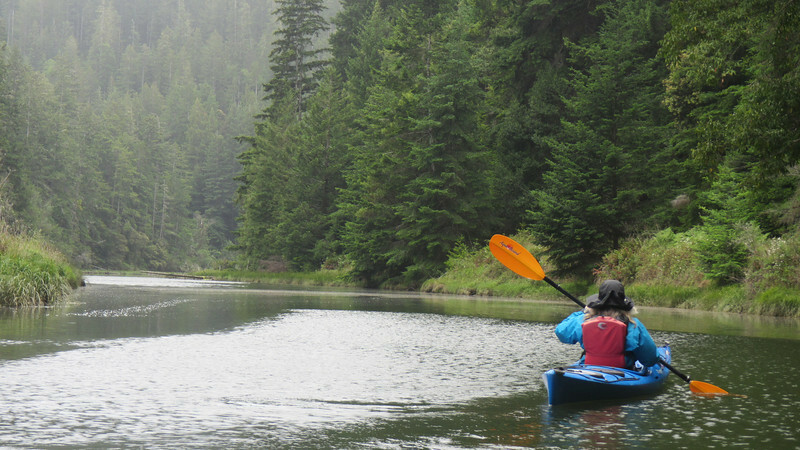 During the Albion Weekend, paddling clinics are being offered by the Headwaters. 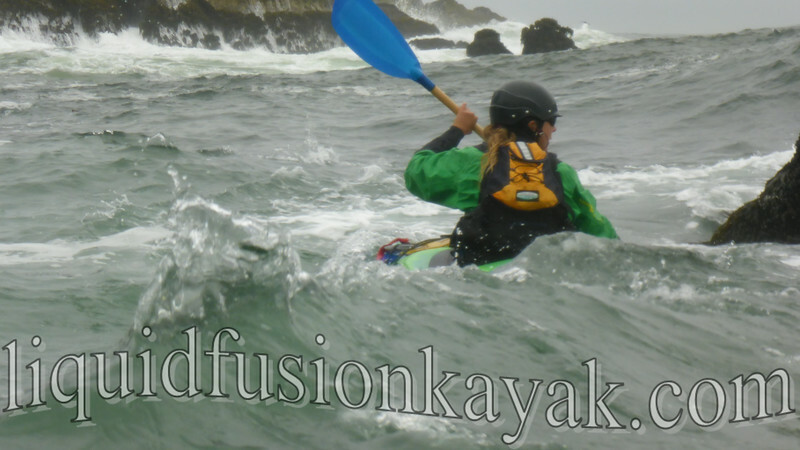 Cate of Liquid Fusion Kayaking will also be teaching LFK's Whitewater of the Sea Class . . . this is a great introduction to rock gardening using highly maneuverable and playful whitewater kayaks (provided for the class). 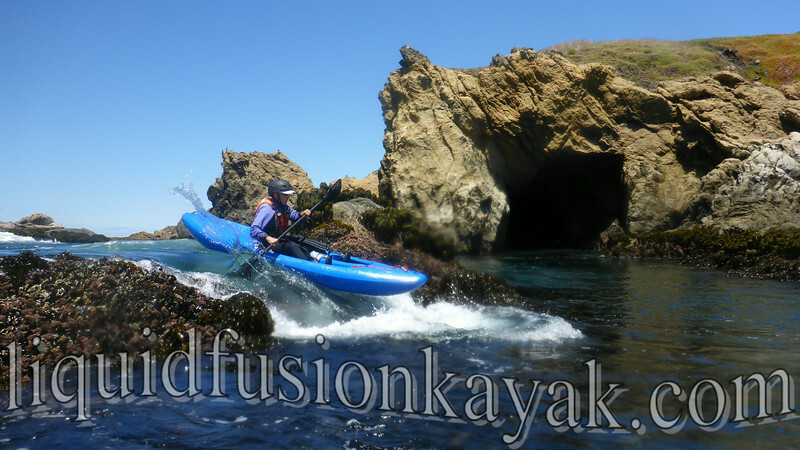 Liquid Fusion Kayaking's Whitewater of the SEA!!! 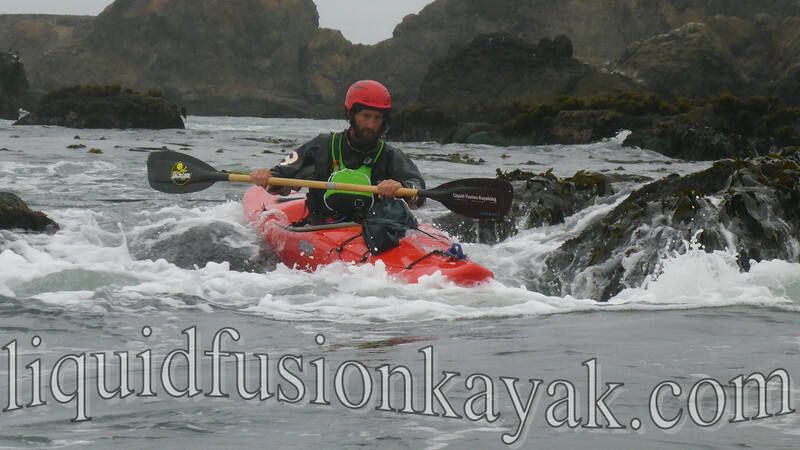 Friday - Sunday, Jeff Laxier of Liquid Fusion Kayaking will be coaching a 3 Star Sea Kayak Training. If you want to learn skills appropriate for paddling on the ocean and become a better asset to your paddling team, a 3* Training should be on your paddling agenda. Jeff will be also be coaching this course at Alder Creek's BCU Week in October. Check out Paddlesports North America for more details on Star Trainings. Fishing - Salmon is still in season but the season for fishing for rockfish by boat (kayak) ends September 1. Mussels are still quarantined. For the divers, abalone is still in season as is spearfishing. Driving to the Mendocino Coast - the roads are winding and slow. Drivers are required to pull over, when it is safe. Please use pull-outs if others are traveling faster than you. Here's a link with useful driving information. Get fresh goods at Mendocino County Farmer's Markets. The Mendocino's farmer's market is Friday from noon to 2pm. The Albion Farmer's Market is Sunday from 2-4pm. The Fort Bragg Farmer's Market is Wednesday afternoons from 3 to 6pm. Harvest Market in Fort Bragg and Harvest at Mendosa's in Mendocino are locally owned and operated grocery stores with local produce and tasty beverage selections. COFFEE!!! Support a local, fair-trade coffee company. Thanksgiving Coffee is roasted in Noyo Harbor and served at most coffee shops on the Mendocino Coast and sold in the local grocery stores. For drive-though convenience, there is the A Frame just south of the Noyo Bridge in Fort Bragg. For those hankering for a fresh beer and pub food, Patterson's in Mendocino is a good stop (be sure to bring cash as many Mendocino businesses do not accept credit cards). If you arrive and realize that you have forgotten something, The Outdoor Store in Fort Bragg carries quality outdoor equipment and gear and often has really good sales. Subsurface Progression on Highway 1 will have wetsuit rentals, pfd's, and dive gear. 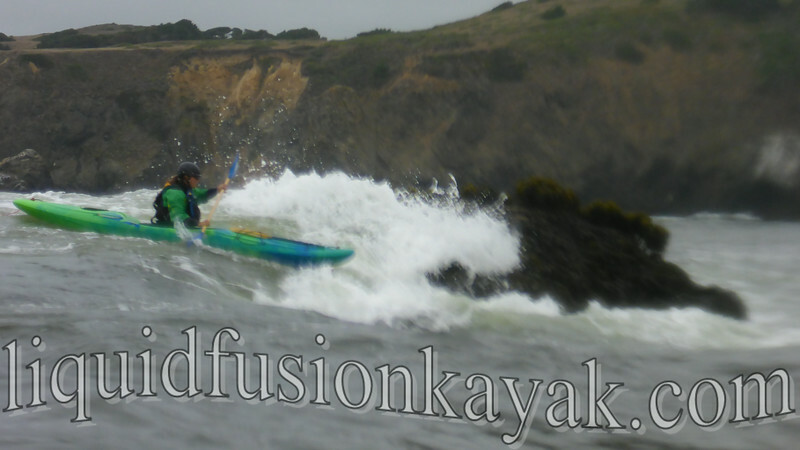 If you are looking for a deal on used kayaks or gear, check out Liquid Fusion Kayaking's online yard sale of new and used kayaks and equipment. 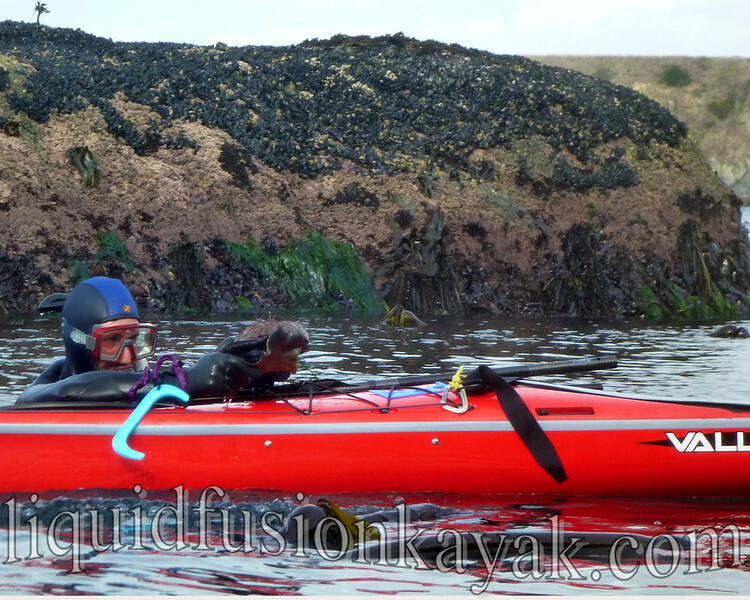 Kayaks, paddles, sprayskirts, helmets . . . lots of great gear on LFK's Online Yard Sale. Other Mendo Stuff -There is so much to do and see on the Mendocino Coast that you would have to live here to experience half of it. Here are a few other things that you might want to consider on your visit (this trip or the next). For more information, check out Fort Bragg.com and the Mendocino Coast Chamber of Commerce. If you are interested in art inspired by the sea, we recommend checking out Glass Fire. Here you can watch fellow ocean lovers Buster and Trish blow glass into jelly fish and other sea creatures. They are on Highway One just north of the Mendocino Coast Botanical Gardens (another of our favorite spots). 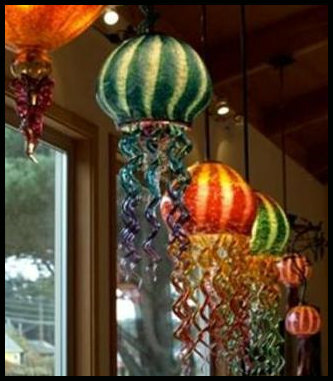 Hand blown glass jellyfish at Glass Fire. For those that like mountain biking, Jackson State Forest offers miles and miles of epic singletrack mountain biking. Pick up a map at the Fort Bragg Cyclery or contact our friends at Mendocino Bike Sprite for a guided ride (you never know who you might see out riding in the forest). We look forward to seeing everyone so please drive and paddle safely. Please call or email us if you have any questions.